Another associated aim of dalit literature is the creation of a literary circle that will nurture younger talent and train them to work for dalit liberation. They will usher in a casteless society with one united race inhabiting it – the Indians. Like many contemporary poets from Odisha, Pitambar is an ardent lover of rain and rivers which bring a promise of renewed vitality. His aim is to achieve cleansing of the minds by purgation of pent-up feelings and angst. He is a committed artist. 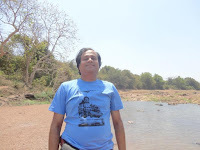 His poems remind us poems on rain and rivers by Niranjan Mohanty and Bibhu Padhi. Pitambar is a part of an amazing tradition and legacy of poets. The aim of dalit literature movement is to facilitate dalit liberation. This journey is just nothing to something. The wheel has started turning. Dalit writers are writing back. We cannot deny the intermingling of thoughts, contexts, engagements and concepts of these writers, which make them unique. They are aware selves who can think beyond a definite boundary and create their own space. Translation is an intimate act of reading. Translation is like transfer of power. Identity is always a kind of representation of oneself to Others. There is a power hierarchy between the Bhasa text and the translated one. Emancipation of dalits is constantly on-going movement. It has seen many changes. Translators of this collection from Odiya to English include Jayanta Mahapatra, Panchanan Dalai, Amiya Kumar Patra, Sapan Kumar Jena, Kmal Kumar Mohanty, Bibhudatta Mohanty, Rajendra Das, Namita Nayak, Kishore Panigrahi, and Gobinda Sahoo. Translators have tried to remain close to the texts in original. A good foreword to the book would have given us the background and the immediate literary contexts of the poet and his commitments. Poems in this collection go beyond a predictable tag and attain universality in appeal. No doubt the reader will not remain indifferent after encountering the poems in this collected volume, The Mortgaged Man. Notes:“Bama Faustina: Conversation with Jaydeep Sarangi” , Muse India: http://www.museindia.com/viewarticle.asp?myr=2012&issid=45&id=3636“Jaydeep Sarangi in Conversation with Jatin Bala”, Stories of Social Awakening: Reflections of Dalit Refugee Lives of Bengal ,Paperback by Jatin Bala (Author), Jaydeep Sarangi (Editor), Authorspress, New Delhi, 2017.